Not everyone steps into the career that his college has groomed him for, and that was almost the case with Michael Maiden. The artist majored in art foundry techniques at Central Washington University, then ventured into the education world for three years, before returning to his foundry roots. In 1975, he established Maiden Foundry, and now alongside several dozen employees, he continues to build on their worldwide reputation from their studio complex in Sandy, Oregon, just outside of Portland. Maiden is a pilot in addition to a sculptor, and his love of aviation works its way into many of his creations. 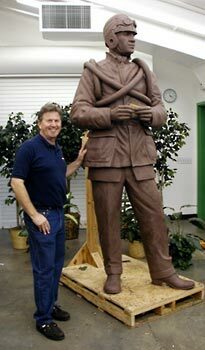 For the last three years, he has been working on a larger-than-life bronze series for Naval Aviation Monument Park in Virginia Beach. Several figures in the series are already installed in tribute to different naval aviation eras: Eugene Ely is represented, as the first person to fly off a ship's deck. Another scene uses an actual section of a WWII aircraft carrier and a recreation of a hatch door from the Midway. The third installation depicts modern naval flyers, from the Korean War to the present, and it features the country's first tribute to female combat pilots. Maiden's team is working on homecoming scene now, and will install the final figures this fall. The foundry's output isn't all about aviation, however. Their original pieces range from six-inch sea turtles to a twenty-foot-high likeness of Queen Charlotte, and their bronzes are represented in worldwide centers of power: The White House, The Vatican and the Royal Palace in Madrid. The Maiden Foundry produces the castings for about 25 other U.S. artists who publish in limited editions. To accomplish this at the high level of quality the foundry is known for, the staff comprises not only artisans, including patina artists, welders, toolers and model makers, but also experts in landscape design, interior design, graphic design, and hydro, structural, and civil engineering. This full spectrum of talent allows them to offer an array of services to artists, from web portfolios and promotional print materials to custom finishes, bases and crating. "An artist might bring in a 12-inch model that they'd like to make 8 feet tall. The newest area is digital enlarging; within the last years it has become really feasible. A small model is scanned and becomes a three-dimensional database, and within a computer it's enlarged to end size. The sculptures can be reproduced at that scale with a three-dimensional milling machine. It's typically milled out of foam material - sometimes Styrene or polyurethane, some kind of medium that can be easily milled by CAD driven machine. That can take up to a year for larger pieces. Once the large clay model is completed, then it becomes more or less a routine of molding it. The typical approach is a rubber mold material that goes over the model. That's supported with a secondary, stiffer mold. You put the rubber on the sculpture, then you put something on like fiberglass. Once you've got a rubber mold, you've captured everything and you can reproduce it from that mold." As for his own work, American Bald Eagles are what he displays most in galleries, and he's sold thousands of them. The reward has been more than monetary. "I've enjoyed doing those birds, for everything from their patriotic symbolism to their environmental recovery," he says. That patriotism is reflected in names like The Great American, a 100-pound eagle cast from .999 pure fine silver. It's also acknowledged in his other art. 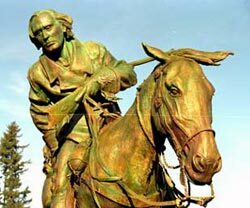 USA Today commissioned him to do copy of the Statue of Freedom that crowns the U.S. Capitol Building. 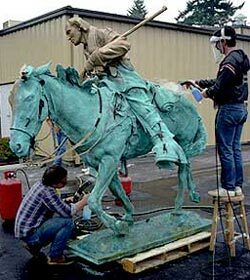 His 8-foot-tall version now anchors Freedom Park, the outdoor museum in Arlington, Virginia. Maiden has built one of the largest foundries in the world - thanks partly his skilled and dedicated team, and partly because he's managed to blend his training with his talent, and business acumen with his personal passions. And that, is the art of success.